Now an award winning artist, Louise was originally educated as a scientist. Louise first formally studied art as a part-time Foundation degree student at West Notts College, Mansfield, UK. She is now completing a Masters (Fine Art) at the University of Lincoln, UK. Louise is passionate about the materiality and intimate physicality of her practice, particularly expedient, novel painting techniques , but she is also a sculptor in various mediums. Emerging socio-political themes of human vulnerability, diversity and the power of human choice (anthroposcene) are referenced in her increasing move into making and installing public works. Louise won the 2017 Artescape Award. She is an Associate to the renowned Backlit Studios in Nottingham and the author-publisher of Art Zines "Parergon". Narratives around aspectss of time and the aquisition of human knowledge are introduced alongside arguements for the value of imagination in human experience and the bridging of science and art. Her dissertation is entitled "Mental Spaces and Possible Becomings in a Fine Art Practice: towards a denial of time." Louise is interested in the slow degeneration of all matter and how chaos tries to reform into order and the effect of human interference. Her Detourned Series of deliberately joyful and naive semi destructed paintings take influence from the Situation Internationist painters like Asger Jorn. Louise's Parergon Series of larger heavily abstracted paintings, influenced by the writings of the philosopher Derrida, also reflect her varied research around knowledge and the Sublime, and often by personal lived moments connected to nature. Louise sculpts in wax, ceramics, glass, plaster and wood and she has now made First Edition bronzes: "Invulnerable", shown at the TIGHT MA Degree Show. She embraces happy and chaotic accidents in her energetic processes, encouraging audience participation, in her Jigsaw Series, handling the contours of ceramics or by walking through portals of silk and steel. She is emerging as a maker of larger scale, site specific, public installations. Louise is a colorist. In both her figurative and abstract work, she applies color with a carefully constructed juxsta positioning of hue, tone and repetition, designed to manipulate the onlooker's unconscious to create emotional responses. Her unusual scientific background allows Louise to blend research practice from across many disciplines, for example knowledge of the physics of light and waves in the use of paint and she makes many references to science. Her "Vulnerable Sky" public instalation was erected between the sister faculties of art and science at the University of Lincoln. A recurring theme in all of Louise's work, both in fine art and beyond, is human communication. Her research work touches on communication in many forms that include verbal, non verbal, written, tactile and visual. She argues that fine art can provide otherwise inexpressible knowledge that can enhance research and debate across all faculties. As the author of an Art Zine, Parergon, Louise promotes her passionate belief in the value of art and art education in advancing human knowledge. 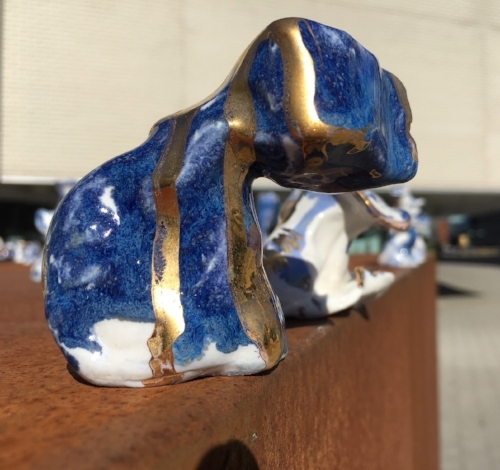 "The Vulnerables", made after a life-changing family accident, is a series of 100+ unique ceramics in the great "blue and white" tradition, ehanced by gold, and variously staged, outdoors or spot light, references an emerging interest in the vulnerability of humanity, diversity and the power of human choice. Louise enjoys developing novel techniques but often pays homage to favourite artists such as Malevich in her work. There are also visible influences from a diversity of artists such as Barlow, Richter, Hepworth, Caravaggio, Keifer, Hodgkin, Pollock, Cragg, Ai Weiwei, Warren and Tucker. Originally trained as a doctor, and with postgraduate qualifications in philosophy, Louise has travelled widely, visiting, working and teaching in Africa, Asia, Canada, the United States and Europe. A Londoner by birth, she is currently based in the United Kingdom, with frequent visits to New York. Her life experiences continue to inform her artistic research through practice.